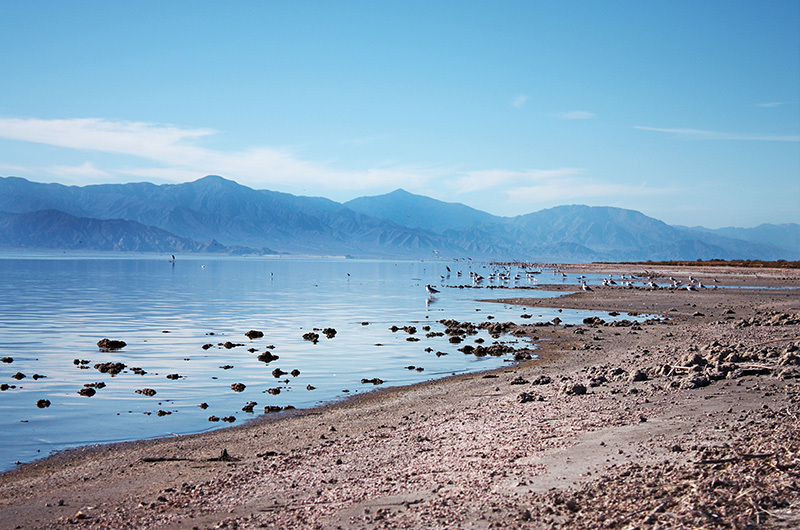 The Salton Sea is an inland lake at the northwestern tip of the Sonoran Desert in California. It sits directly on top of the San Andreas Fault Line, is roughly 280 feet below sea level, and covers 350 square miles. This shallow lake was accidentally created when the Colorado River breached an irrigation canal in 1905, causing a massive flood. Just like that, there was an oasis in the middle of the desert. 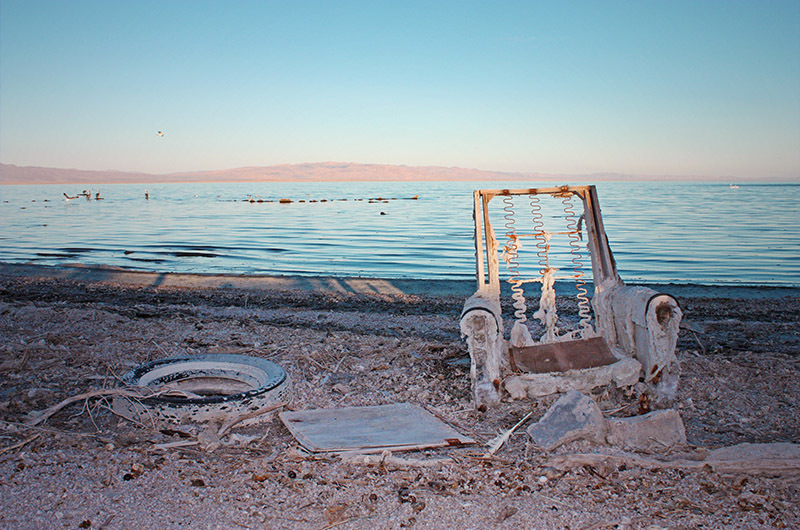 Almost overnight, the Salton Sea was overrun by wealthy vacationers from Southern California and celebrities looking to get away. Everyone from Frank Sinatra to Jerry Lewis and the Marx brothers were members of the local Yacht Club. 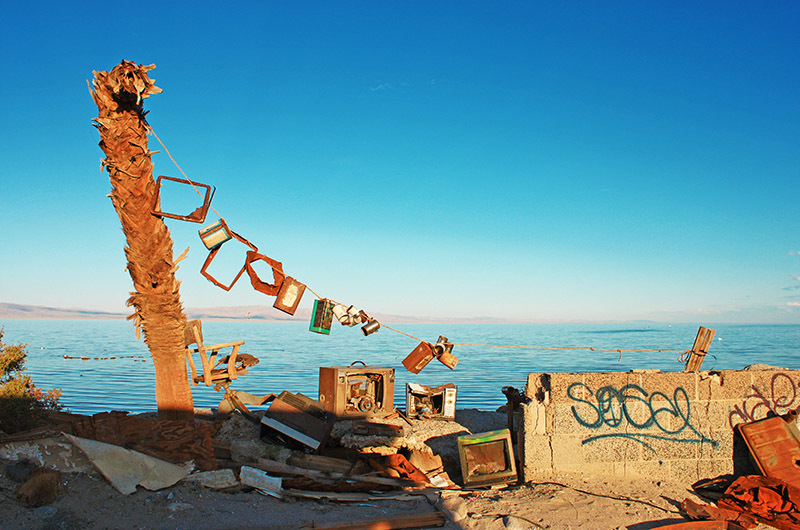 The Salton Sea had become a full blown resort destination. Unfortunately, the vacation didn’t last long. Heavy salt deposits from local rivers and agricultural runoff, pesticides, and fertilizers from local farmland quickly saturated the Sea. With no natural outflow, the high salinity and pollution levels rose drastically making it nearly impossible for anything to survive here. Fish began dying off by the thousands and water contamination halted most leisure activities. It is now estimated that the Sea is roughly 25% saltier than the Pacific Ocean. The high salt concentration continues to drastically change the landscape of the area. The shorelines are now covered in piles of sun-bleached fish remains and dried salt deposits forming a hard, crunchy surface that turns to powder as you walk. The aroma here is similar to what I would imagine a sardine factory smells like. The salt-filled air has sped up erosion of the vacant buildings, abandoned cars, and littered furniture that surround the lake. Everything has a weathered and worn look; if the salt doesn’t do it, the constant sunshine will. While high salt levels may be bad news for anything living around the lake, it proves to be a stunning addition to the scenery. The dried and cracked salt beds shimmer beneath the sun and provide a remarkable Salvador Dali-esque terrain. The high salinity level of the lake forces the water to stand unnaturally still, while the dry desert air, and lack of breeze makes the air just as stagnant. Combine this with the lack of noise from nonexistent marine life, the lack of people, hazy mountains in the distance, and eerily pastel sunsets for an unforgettable landscape. 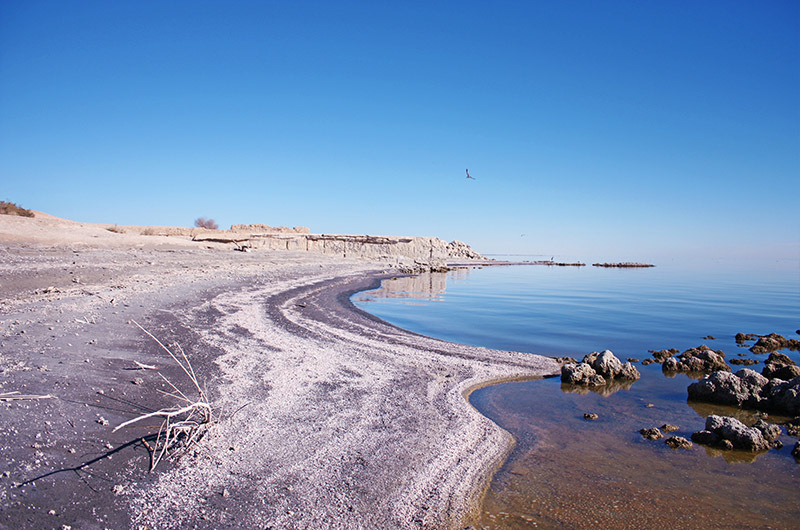 Many people are trying to deplete the Salton Sea for health and sanitary reasons, while others fight to restore and preserve this unique time capsule. 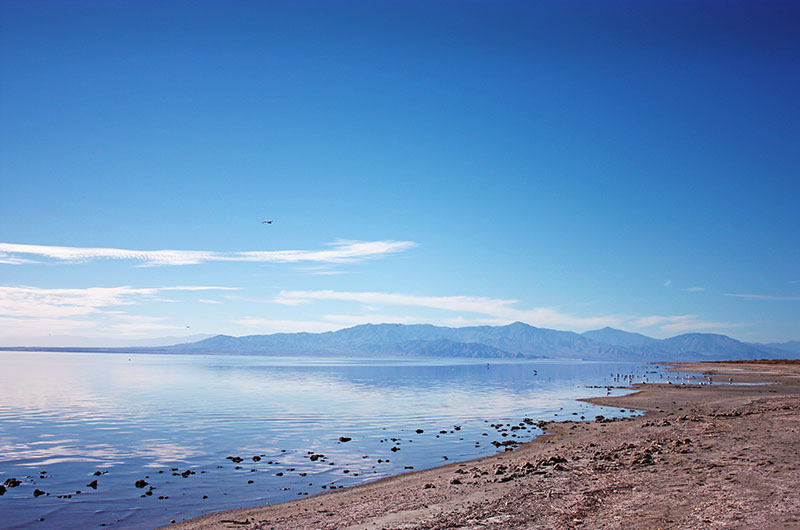 As of January 2017, the largest rural-to-urban water transfer in the United States history is helping to drain the Salton Sea, making it a rapidly disappearing destination that may soon only be viewable through old photographs. While the water is quickly drying up, the abandoned homes and buildings that add so much character to the area are also being demolished, or simply crumbling in on themselves. This place is an amazing sight to see, unfortunately, it won’t be around much longer. At least not the way it stands today. 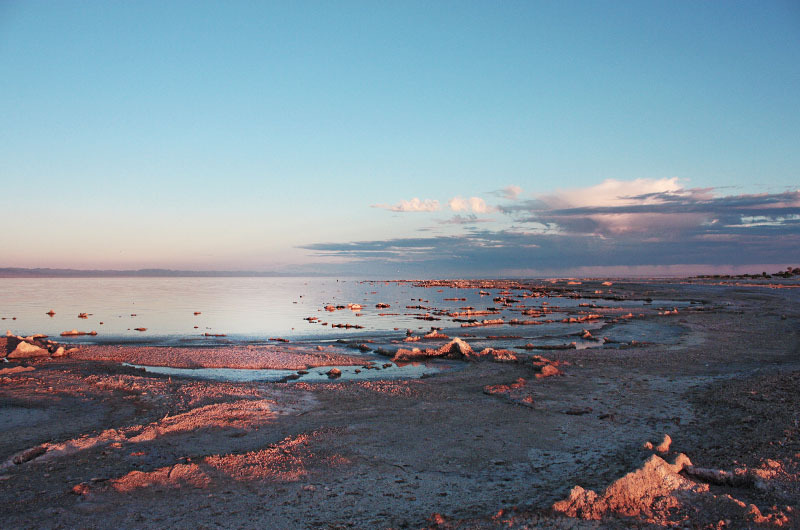 The Salton Sea itself has plenty to offer when it comes to landscapes and unique history, but the surrounding area offers even more attractions. If you’re looking for well-known tourist destinations, Palm Springs is an hour drive north, Coachella Valley is roughly 20 minutes north, and the Joshua Tree National Park is about 45 minutes northeast. 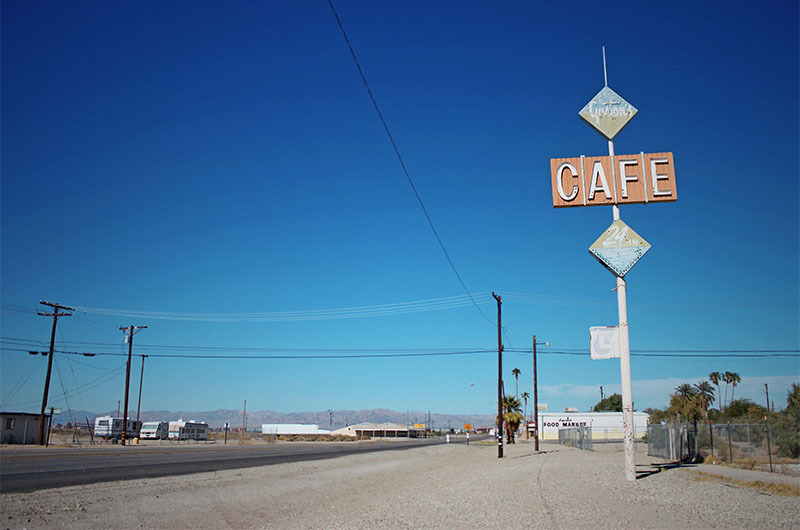 In my opinion, the real attractions can be found on the outskirts of the Salton Sea. 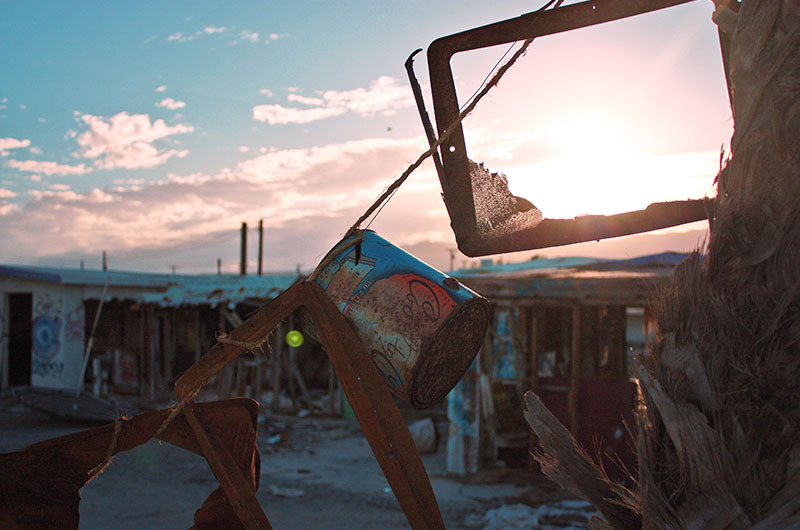 The town of Niland, Bombay Beach, Slab City, and Salvation Mountain are all in desperate need of attention. This near ghost town was once an agricultural power house. Its fertile soil made it the ‘tomato capital of the world.’ In fact, the town’s name is a playful nod to the fertile soil of the nile valley—‘Nile land.’ Today, the town serves as a jumping off point for nomads and explorers traveling to Slab City, Salvation Mountain, or the Salton Sea Mud Pots. A stark reminder of what could have been. Designed to be the French Riviera of California, Bombay Beach was supposed to be the playground for the rich and famous. The rising salinity of the Salton Sea and massive floods have caused irreversible damage to this could-have-been resort-town. This is a great place to see abandoned homes, decaying buildings, graffiti, peculiar art installations, and of course unique landscapes. There isn’t much here that screams beach, except for the water, and you can’t, well definitely shouldn’t, swim here. A photographer’s paradise, this is a great place to witness the juxtaposition of salt covered ruins and functioning family homes. Make sure you get out of the car and wander around here. Where supertramps, nomads, runaway felons, the Christopher McCandless fan club, and the curious traveler go to disappear. If you’re like us and are deeply inspired by Into the Wild, then this place is absolutely perfect for you. There are no rules, no laws, no established services, no electricity, no water, and no normalcies. Vagabonds and wanders have created an entire community by setting up tents, campers, school buses, cardboard shacks, and make-shift housing on small cement slabs. Originally Camp Dunlap constructed for the Marine Corps, the land was eventually conveyed to the State of California. It wasn’t long before squatters began camping out here and eventually took over the area. 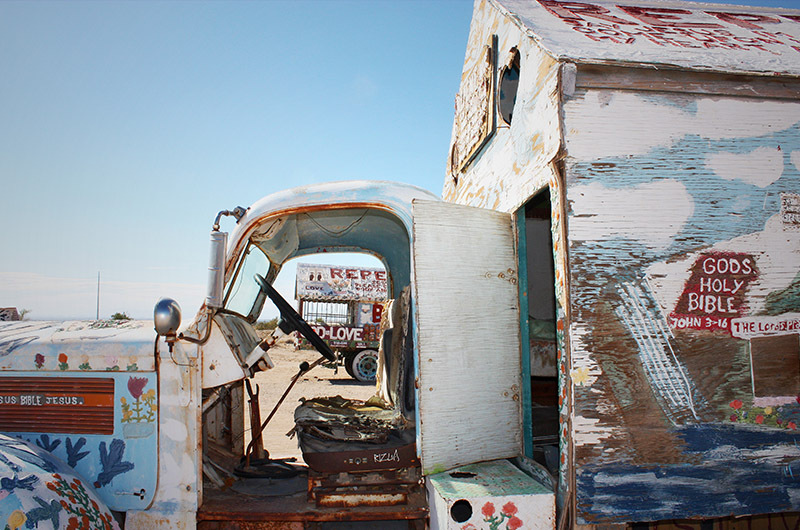 Slab City is commonly referred to as the last free place in America. A few words of caution, things can get a little weird here. 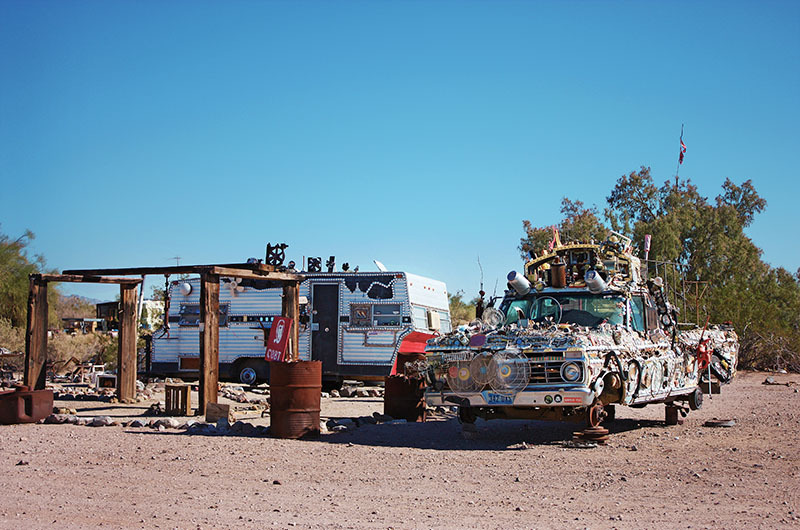 The nomadic tenants have found clever ways to decorate their slabs, collections of toilets, broken televisions, piles of old shoes – there is no telling what kind of oddities you may see. Not to mention, it takes a special person to live in a tent on a cement slab in the middle of the desert. Get ready to meet a lot of interesting people. 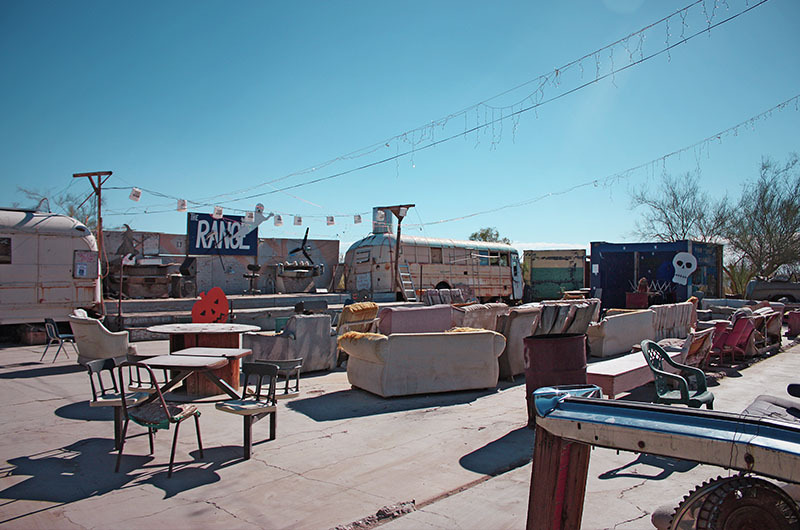 Deep inside Slab City sits an open-air bar and venue made from old trailer tires, rusted out bench seats, and lawn chairs. It’s known for it’s wild nights, lively crowds, and lawless atmosphere. 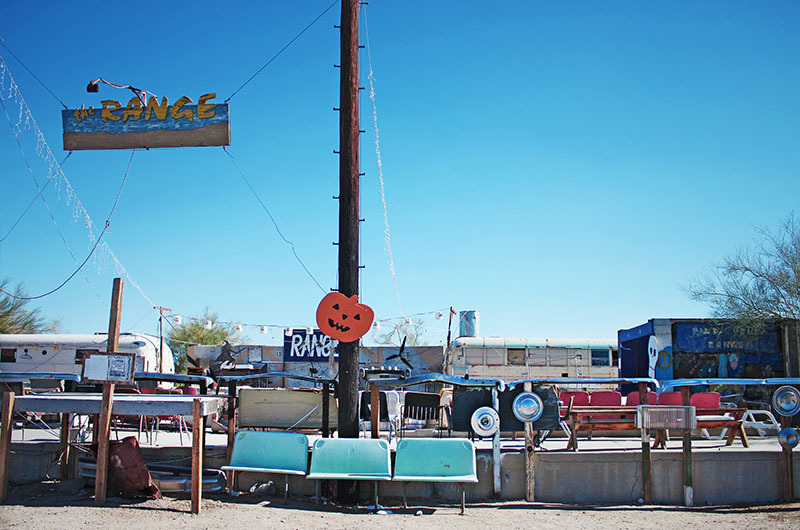 At first glance, this bar looks like a junk yard, or a forgotten club house. Make no mistake, the Range is still in operation. Concerts are held on Saturdays and there is an annual Prom Night hosted here. The lowest bar in the Western Hemisphere. This is what dive bars strive to be. During our visit here, the back wall of the bar was filled with white cans labeled Fish Assholes in bold black lettering. Cans were $3 each and the money was donated to the local fire station. Due to a very strict code of ‘don’t ruin the surprise’ ethics, I can’t tell you what’s inside of the cans. I can tell you that they serve food, a weird atmosphere, and cold beer. You will definitely feel like an outsider here, but in a good way. Make sure you talk to the locals, most of them have a pretty interesting story. While I wouldn’t say this is a destination on it’s own, it is something that you will most likely drive by and probably stop to look at. Salvation Mountain is a manmade art installation in the middle of the dry and barren desert just East of the Salton Sea. The mountain itself stretches 50 feet high, 150 feet wide, and is covered in over half-a-million gallons of donated latex paint. 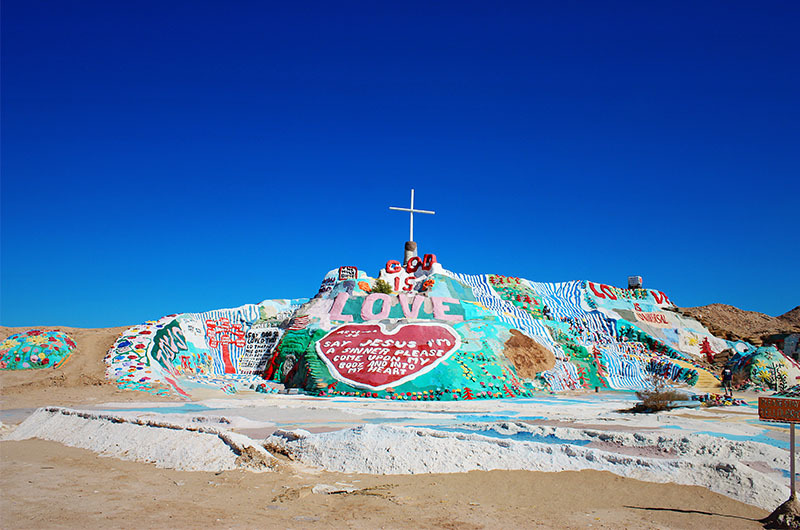 Leonard Knight created the Salvation Mountain as a tribute to God and love. For nearly 30 years he layered cement, dirt, and paint to create the mountain you see today. The monument is now maintained by volunteers and artists who hope to keep the fascinating attraction alive. There is no fee to tour the mountain, but visitors are encouraged to donate paint to the cause. 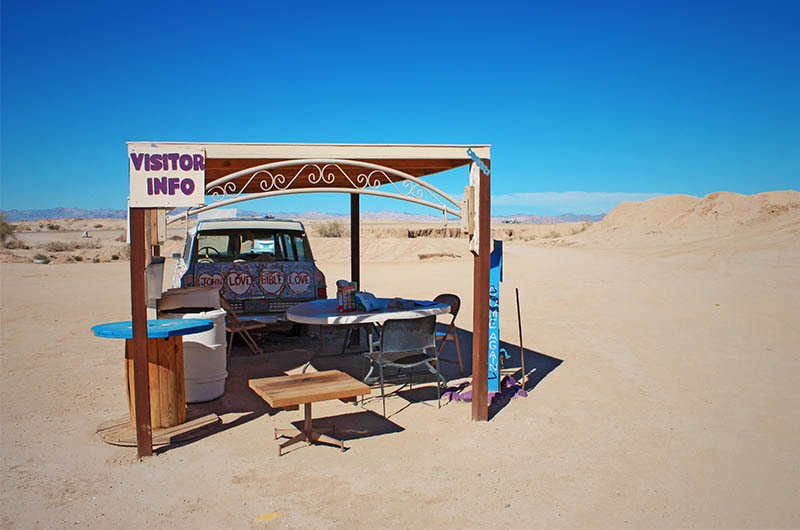 Whether you are on a day trip, just passing through, or on a detour from the Salton Sea or Coachella, Salvation Mountain is an entertaining attraction. 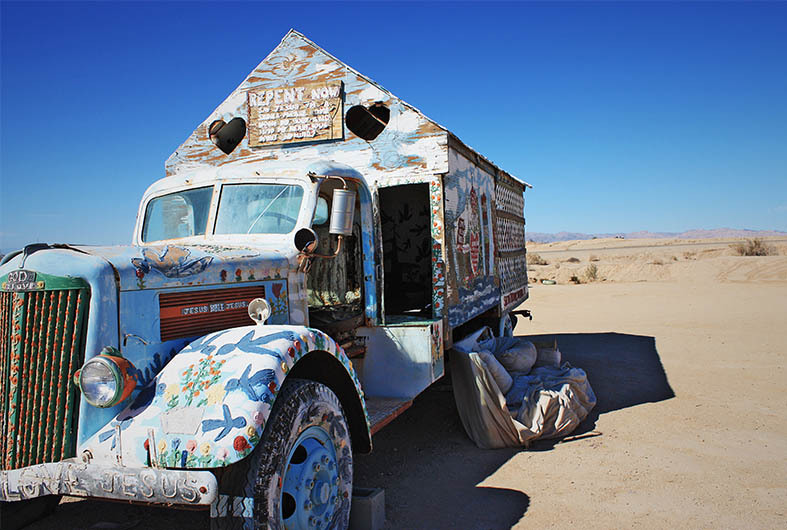 This artistic oddity is surrounded by bizarre art pieces, elaborately decorated trucks, wooden boats, and a uniquely intriguing landscape. 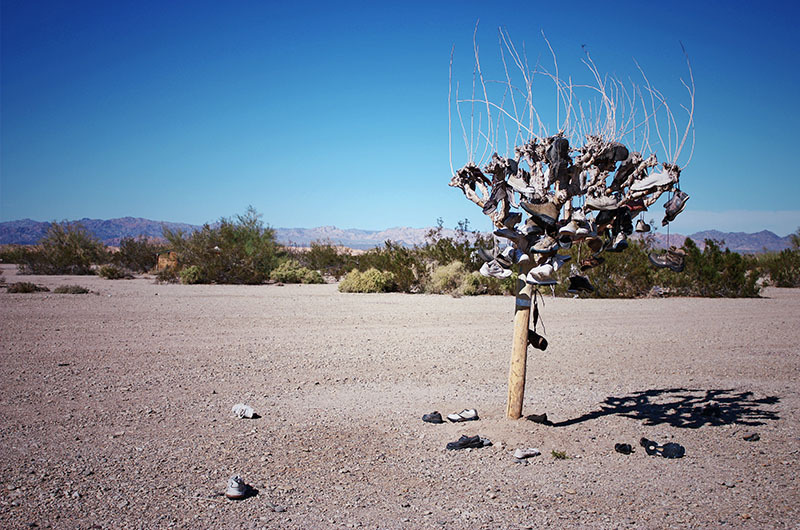 If that’s not enough to satiate your weird art craving, Slab City sits just across the street. A dollar to enter, unless you buy something. It’s a novelty and it is exactly what is sounds like. Hours of operation can ‘fluctuate’ a bit, but if you love bananas or the color yellow, you will love this unique little roadside attraction. A geothermal mixture of mud, ash, and water. These mud pots make fantastic burbling noises and are a sight to see. Bring extra shoes, as you are sure to sink once or twice and cover yourself in clay. Located on private property, it is generally okay to check out these mud volcanoes, but remember to be a courteous guest. One of the best places for bird watching in Southern California. The NWR was established in 1930 by Presidential Proclamation and claims approximately 35,000 acres. The flooding Salton Sea has encroached on much of the land and only around 2,200 manageable acres remain. 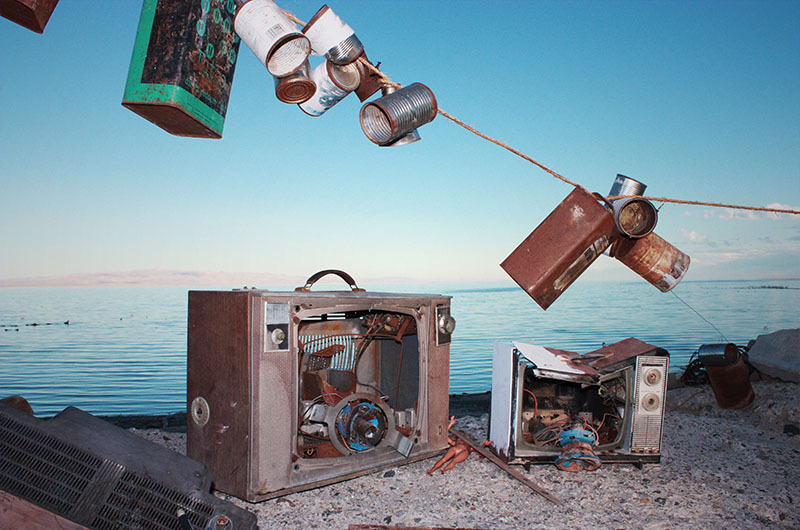 Have you been to the Salton Sea? Know of any other obscure destinations? We’d love to hear from you!